Most Ravnica sets come with a host of new keywords to play around with. Each one takes a bit of time to master. With Guilds of Ravnica, you've had a few months now to play around with convoke, jump-start, mentor, surveil, and undergrowth. While no single one may have blown your mind, each offered their own dimension to the experience. Ravnica Allegiance is no exception to that penchant of introducing new abilities. And there's one decision you're going to have to make a lot if you're a red or green mage. It looks simple—and yet it can be deceptively tricky. 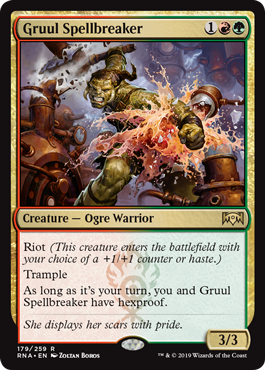 Riot, the Gruul keyword, likes to help your creatures smash. But is it speed or size that matters more? The answer, of course, is "It depends." Let's dive in deeper today! The big question you always want to ask when playing with riot is "What's already on the board?" If the board is cluttered full of creatures and in a stall, usually you'll want the +1/+1 counter unless that haste attack is going to let you break through for the right amount of damage. So, let's focus on some one-on-one creature situations. For a pretty simple scenario, if you have a 3/3 with riot and your opponent has an untapped 4/4, you clearly shouldn't play yours with haste. (Unless you have a way to otherwise pump up your creature.) It'll just get munched on by their 4/4! But let's say instead that 4/4 of theirs is actually a 3/3. Well, now we have a bit more of a discussion. If you play the 3/3 haste and attack, you're offering up the trade. Either they take 3, or trade off their creature. However, the key here is that your opponent gets to choose—not you. If they think it's better for them to trade, they will. If they would prefer to race, then they are taking the damage. As a result, generally in this situation I prefer to outclass their creature with the larger creature. Then you can safely defend against their creature, or potentially attack through next turn. What about if they have a 2/2 and you have a 3/3 riot? Well, in this case, we need to start looking at something else: life totals. It's a famous question coined by Mike Flores, and absolutely a huge factor here. Do you need to play offensively or defensively with these life totals? As the article goes, it's always crucial to know who is the aggressor and who is the defender in any given situation. The aggressor should make plays to press that aggressive advantage and the defender should make plays to—you guessed it—quell that aggressive advantage. For example, if you're at 4 and your opponent is at 20, you should leave your 2/2 back to block their 2/2 instead of attacking. This plays heavily into riot. If you're the aggressor and the game doesn't have that many turns left, then pressing in damage with haste makes a lot of sense. If you, for the sake of example, assume your creatures are unblocked, it takes three turns for the +1/+1 counter to make up for the additional attack made from the haste. On the flip side, if it's early on and the game has plenty of time left, or if you think your riot creature might get outclassed by your opponent's next play, then making the bigger version helps a lot. For example, if you know your opponent's deck is full of 4/4s, then you probably want to make your riot creature a 4/4 rather than swing in for 3 so that it is able to stack up against their creatures later on. Keeping your opponent's life total in mind is crucial for playing riot correctly. In general, when in doubt with riot, I would lean toward the +1/+1 counter. That's going to be relevant the rest of the time that creature is on the battlefield, instead of just dealing a bit more damage for this turn. Riot puts more haste into the format, so as someone playing against any deck with red or green, always be wary of all those riot creatures and that there's a bit more haste than normal. Much like how, say, the awaken mechanic infused more haste into decks in Battle for Zendikar, you can also expect to find more of it than normal. You should watch out . . . and so should your opponents! With any haste creature, but especially with riot since you get another choice, there's always an option to keep in mind: not playing the creature at all! Let's say your opponent is low on life. Your opponent has no cards in their hand and an untapped 3/2. You have a 2/2 with riot. Haste is likely to just force the trade, and giving it the counter is also likely just setting up the trade. But, as long as you have a cushy life total, there's another option. Pass the turn back. Your opponent will likely attack. If they didn't draw another creature, that means you can riot for haste and attack for 2 on your turn. If they did draw a creature, well, you paid 3 life for the opportunity. This situation doesn't come up that often, but when it does, it's important to keep it nestled in the back of your mind. It could just be the difference between dealing those last few points of damage or not. Ah, good old "Wurm's Command." You choose two of four things, and there are some good reasons for each. This creature is engineered to have plenty of play against aggressive, midrange, and control decks alike. Against aggressive or midrange decks, you can play a big creature and kill off one of theirs. Against control decks, you can blow up one of their lands (perhaps an Azcanta, the Sunken Ruin?) and then attack for some haste damage before they get in a board sweeper edgewise. There's a few other interesting facets to keep in mind here as well. For one, in any kind of mirror match, you're really going to want that +1/+1 counter: that way, your opponent's Ravager Wurms don't gobble up yours when they fight. 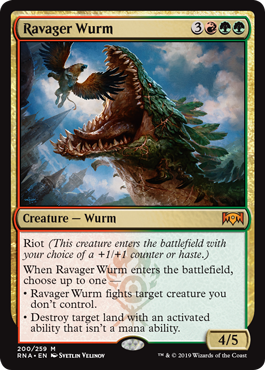 You're also going to be wary of how many lands with activated abilities you're playing; it's a bit gnarly if your opponent's Ravager Wurm keeps you from casting yours! Subtlety was never the strong suit of the Gruul—and this creature comes down, smashes a creature, and then smashes some face. Enjoy! For such a simple-looking Gruul mechanic, there's plenty of deep thought and strategy to riot as well. 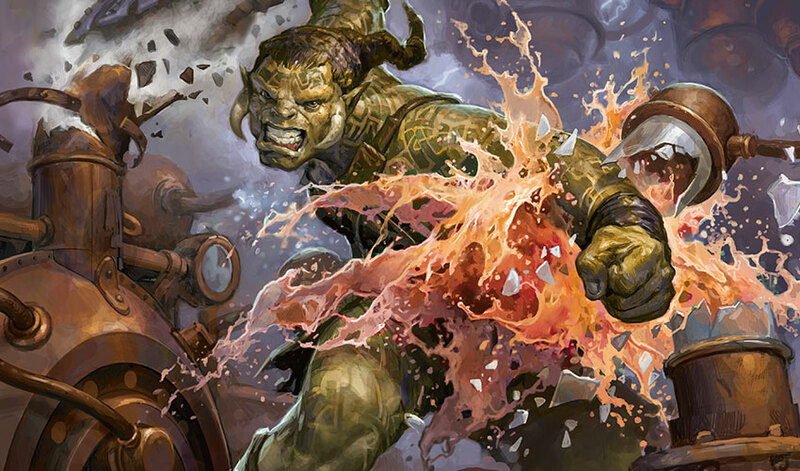 Of course, Gruul isn't alone in that respect: each of the five new mechanics of Ravnica Allegiance possess their own tricks and elements to master, and I hope you have a blast with them! And when you go to your Prerelease and make riot decisions, hopefully you reflect back on this article and make the right one for the situation. I hope you enjoyed reading about some of the strategy behind riot. Have more thoughts, questions, or comments? Please reach out to me! You can always find me on Twitter, Tumblr, or by sending me an email at BeyondBasicsMagic@gmail.com. Have a great time with Ravnica Allegiance previews, start planning for your Prerelease, and I'll talk with you soon. Have fun!